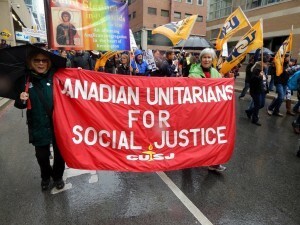 Some individuals or congregations choose to form a CUSJ chapter in their area, so that social activists in one or more congregations can share their energy and ideas, and plan actions and events. These chapters may also liaise with local interfaith and social justice organizations, and facilitate Unitarian involvement in larger community justice events. CUSJ and CUC are separate organizations that have a covenant. Although CUSJ chapters may comprise members that also belong to congregations, the chapters are separate entities. They are not subject to Canada Revenue Agency (CRA) or its regulations. We like to compare the CUSJ member dynamic to particles and waves, which can morph from one form to another: When you are conducting educational activities for your congregation, or passing resolutions through your annual general meeting you are a particle. When you step out into the street to create a Unitarian presence on important social action issues with your CUSJ Banner, you are a wave. Forming a chapter is easy! Before beginning, please read the Guidelines for CUSJ Chapters for the requirements to form, maintain, and disband a chapter. Be sure that you have enough people to form a chapter. Read the CUSJ by-laws and the CUC Principles. We recommend that you print copies to distribute to members at your first meeting. Invite your people to become CUSJ members. The name of your chapter and the names of its members. State that you support the CUSJ purposes; its by-laws and the CUC Principles. Tell us which issues your chapter plans to tackle, and whether they are local, provincial, or national in nature. State that you understand the importance of staying in communication with the CUSJ Board when you are taking action. The CUSJ Board looks forward to receiving your Chapter application! Expect a response within at most 60 days. The CUSJ Board meets the third Monday of the month from 7 pm to 9 pm Eastern time. Chapter members are welcome to attend CUSJ Board meetings. Last but not least, be sure to bookmark this site, and join the CUSJ Facebook group. You can also join the CUSJforum by contacting listserv@cusj.org.